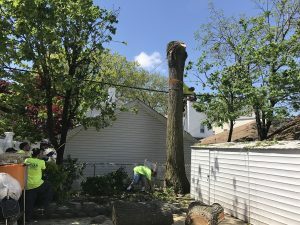 Tarzan Tree Removal, the #1 tree removal service company, provides strategic tree services by trained and qualified professionals in all five boroughs of New York City. The company was started in the wake of Hurricane Sandy, during a time in which neighbors and communities around us needed. Because of this we quickly developed a reputation for emergency tree services. 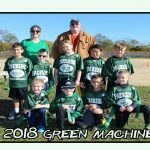 For a year Joseph Messina, the owner, provided tree removal and array of other services day and night with his team until the damages of the storm finally subsided. After the storm was over, Tarzan Tree Removal was officially born first serving Brooklyn and the surrounding areas. Customers all over have helped spread the word about our local tree removal service company by referring us and constantly writing reviews. Our Yelp business account stands out from most tree companies because we only have five star reviews. After the jobs are completed customers have wrote reviews using words like amazing, terrific, fast and excellent. We are constantly praised for our ability to quickly respond and our professionalism. 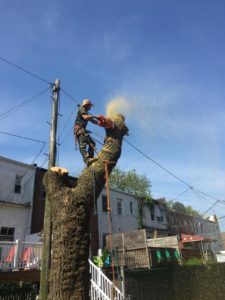 Our local tree removal service company addresses the health and aesthetics of your landscape as well as the safety and liability of host and adjacent properties. In certain instances, it may be necessary to remove a tree that is alive. In such cases the tree may be interfering with the health and vigor of other trees. Or imposing danger on buildings, driveways or utility wires. Our company has an array of skilled climbers and professionals to remove a tree in any type of tight situation. Whether a tree is close to a power line, leaning on a home or next to a fence our team is able to remove it without causing any type of damage. Because our team is so passionate it makes each job easier. Customers can always sense if you do not like your job. When there is passionate plus an experienced crew, any tree removal is possible. Lastly, when it comes to pricing we are known for our affordability. We are always will to work with our clients to make sure that the necessary is completed. It is important that we put safety before aesthetics. And it is also important that clients choose a company that is fully insured and is equipped with workers comp insurance because at the end of the day, you want to make sure that you can trust your tree service.